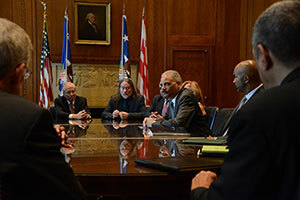 September 18, 2014, New York, NY – On Thursday, September 18, Attorney General Eric Holder announced that John Jay College of Criminal Justice has been awarded a competitive, three-year, $4.75 million grant to launch a National Initiative for Building Community Trust and Justice. John Jay will lead a team including Yale Law School, UCLA, and the Urban Institute as principal partners. The National Initiative is designed to improve relationships between, and especially, racial and ethnic minority communities and the police and other arms of the criminal justice system; and advance the scholarly understanding of, and the public conversation on, those issues. The National Initiative will highlight three areas that hold great promise for concrete, rapid progress. Racial reconciliation focuses on the real and terrible historical experience many minority communities have had with the criminal justice system; how that history shapes current attitudes toward authorities and the law; how the authorities are in turn affected; and how to frankly address that experience and reset relationships. Procedural justice focuses on how the way police and other authorities interact with the public, and how the characteristics of those interactions shape the public’s views of the police, their willingness to obey the law, and actual crime rates. Implicit bias focuses on how largely unconscious psychological processes can shape authorities’ actions, and lead to deeply racially disparate outcomes even where actual racism is not present. The National Initiative will combine existing and newly developed interventions informed by these ideas in five pilot cities (to be selected in the coming months); develop and implement interventions for victims of domestic violence and other crimes, youth, and the LGBQTI community; conduct research and evaluations; and develop a national clearinghouse for related information and publications. The National Initiative will be directed by John Jay Professor David Kennedy as part of John Jay’s National Network for Safe Communities, which works in troubled communities nationally and has been driving innovative practice in racial reconciliation. Professor Tracey Meares and Professor Tom Tyler of Yale Law School bring leading expertise on procedural justice; Professor Phillip Atiba Goff of UCLA will bring leading expertise on implicit bias; and Dr. Nancy La Vigne and Dr. Jocelyn Fontaine of the Urban Institute will bring broad research and implementation capacity. Collectively, the partners are working with scores of cities across the United States on these issues.